Effective treatment of cancer remains one of the biggest medical challenges, due to the large diversity in mutations in individual patients. To tackle this problem, cancer research will need to be performed at a larger scale than is possible within single cancer institutes. 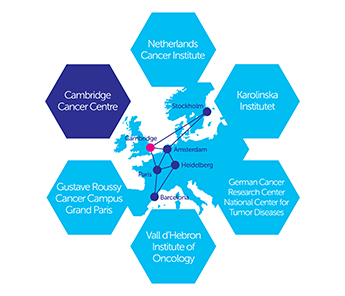 Therefore, Gustave Roussy Cancer Campus Grand Paris, CRUK Cambridge Centre, Karolinska Institutet, Netherlands Cancer Institute (NKI), Vall d’Hebron Institute of Oncology, German Cancer Research Center with the National Center for Tumor Diseases (DKFZ-NCT), and National Cancer Institute of Milan (INT) have created Cancer Core Europe as a working consortium. To build the infrastructure of the consortium task forces have been established in each of the Centres in the domains of “e-hospital”, translational research platforms, harmonization of diagnostics, imaging, omics, biobanking, shared databases, and a virtual joint clinical trial infrastructure (i.e. joint sponsoring of clinical trials). Sharing data across the consortium is an important goal and will be critical to the long term sustainability of the Consortium. The overall goals of this working group will be achieved through a combination of pilot projects and funding through European Initiatives. Cancer Core Europe was established on July 4 2014 when the consortium agreement of Cancer Core Europe was signed in Paris by all members representing their Institutions. Dr Fabien Calvo serves as the Chief Scientific Officer of Cancer Core Europe. Dr Calvo is a pharmacology professor, a past deputy at France’s National Cancer Institute (INCa) and has been part of numerous research networks, including co-launching the International Cancer Genome Consortium in 2008. The first Annual Meeting of the Cancer Core Network was held in Amsterdam in February 2016 and was attended by over 100 delegates that included representatives from a number of biotechnolgy and pharmaceutical companies. The second Annual Meeting was held in Heidelberg in February 2017 and the third Annual Meeting is being held in Paris in February 2018. Please contact Professor Carlos Caldas or Dr Kenneth Seamon for more information on this initiative.